With so many different options to choose from, many of you have asked "What are the most popular combinations?" This is a legit concern! So our team went back and created a "Pairing Guide" so that you can create a delicious poki bowl. It's really simple and easy to follow. It is broken into two sections between "flavor" and "texture" and below is a general breakdown on how it works. If you have any questions feel free to ask any one of our awesome staff members. Cheers to making a harmonious and tasty Pokiland masterpiece! Flavor: The first step in creating a harmonious bowl/wrap is identifying the flavor profile of the protein and then determining which sauce(s) pairs best with it. *Note: Every sauce compliments each fish differently. After you selected your protein with the desired sauce(s) move on down to the bottom right of the guide to finish. Note: You are still allowed to choose up to 5 topping selections. Texture: We believe this is essential because if you have flavor working in conjunction with perfect texture then your taste buds just went from "Good" to "Wow!" The "Texture section could be a bit confusing at first but it is a really simple concept to follow. It's broken down into two sections. For every "hard" topping it counts as a Plus(+) and for every "soft" topping it counts as a Minus(-). The ideal number for optimal texture will be anywhere from +1 to +3. 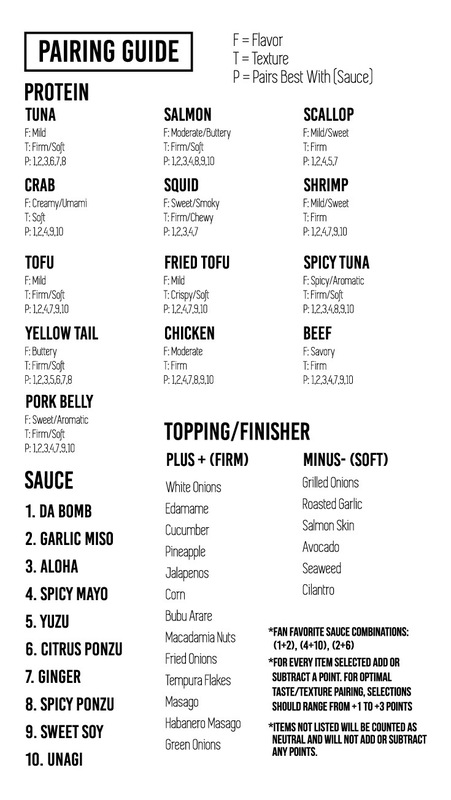 You selected 2 "Hard"(+) toppings and 3 "Soft"(-) toppings. You just created a non-harmonious bowl. If you like this then that is totally fine. This is just a guide and the final decision is up to you! You selected 4 "Hard"(+) toppings and 1 "Soft"(-) topping. You just created a harmonious bowl. Yum!